The original canvas inscribed verso: Mary Bradshaw eleven times, with the date December the 31st: 1763. Garrick had departed for the Continent in September 1763 and was abroad when, according to the inscription cited above, NPG 1167 was given to Mrs Bradshaw. It was once attributed to the Irish engraver and miniaturist Luke Sullivan. A version showing a red silk drape round Garrick’s shoulders is in an American private collection; another with darkish hair added is in the Maugham collection in the National Theatre,  resembling an engraving by Miller of 1790. Another profile of Garrick with his wig by Zoffany was engraved by John Hall,  who also exhibited a ‘print of Mr Garrick’, Society of Artists, London, 1763 (168). 1) Illus. The Ashmolean, 37, 1999, p 10; R. Mander & J. Mitchenson, The Artist and the Theatre, the story of the paintings collected and presented to the National Theatre by W. Somerset Maugham, 1955, p 69 when in the collection of Mrs J. C. Conway. 2) Once erroneously identified as a plate to Smollett’s 1757 History of England (cf. M. Davies, National Gallery Catalogues, The British School, 1946), but see R. Mander & J. Mitchenson, The Artist and the Theatre, the story of the paintings collected and presented to the National Theatre by W. Somerset Maugham, 1955, pp 65-66. 3) Both illus. R. Mander & J. Mitchenson, The Artist and the Theatre, the story of the paintings collected and presented to the National Theatre by W. Somerset Maugham, 1955, pp 70, 72. 4) The 1819 sale description was reprinted below the lithograph; the painting then belonged to George McKenny (R. Mander & J. Mitchenson, The Artist and the Theatre, the story of the paintings collected and presented to the National Theatre by W. Somerset Maugham, 1955, p 67). 5) Cf. Connoisseur, LXXXV, 1930, p 217. Presumably because Sullivan was said to have painted his wife, see Mrs Garrick. 6) R. Mander & J. Mitchenson et al., Guide to the Maugham Collection of Theatrical Paintings, 1980, no.10. 7) Illus. R. Mander & J. Mitchenson, The Artist and the Theatre, the story of the paintings collected and presented to the National Theatre by W. Somerset Maugham, 1955, pp 70, 71. 8) D. M. Little & G. M. Kahrl, The Letters of David Garrick, 1963, I, no.292. M. Davies, National Gallery Catalogues, The British School, 1946, p 13, no.1197, as British School. R. Mander & J. Mitchenson, The Artist and the Theatre, the story of the paintings collected and presented to the National Theatre by W. Somerset Maugham, 1955, pp 65-72, 189. Dark brown eyes, a wisp of black hair below the ear, purple cloak; beneath the portrait, emblems of Garrick’s diverse roles: rosemary and laurel, Pan pipes, flute and sword, masks of comedy and tragedy, the latter with a red ribbon. 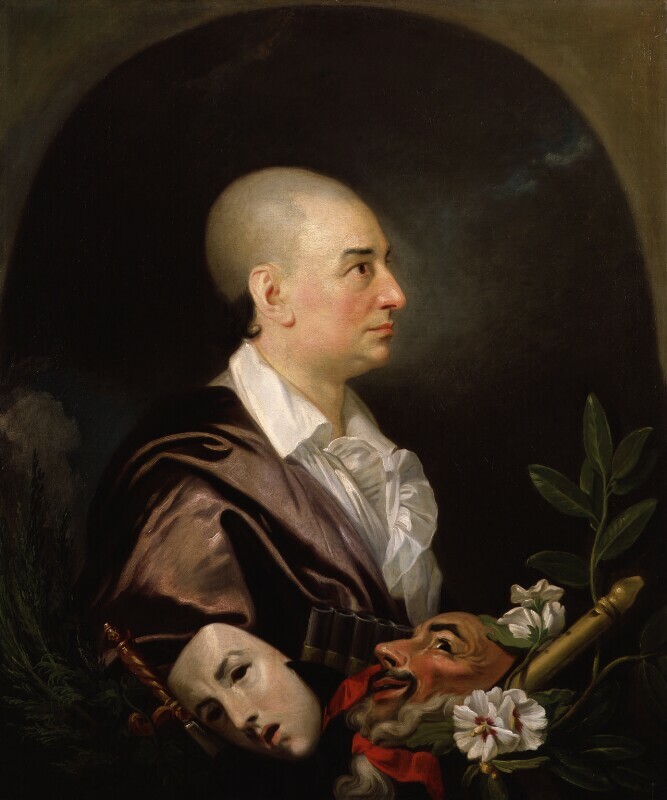 Given by the sitter to Mrs Mary Bradshaw 1763;1 Mrs David Garrick, who bequeathed to her husband’s nephew, Nathan Egerton Garrick, ‘the Portrait of my late Husband without a wig, by Zoffany, which I bought after his death of Mrs Bradshaw, to whom it had been given as a present’;2 his son, Nathan David Garrick, by whose widow bequeathed to the National Gallery 1885 (no.1197); lent to the NPG 1900; ownership transferred to the Tate Gallery 1954 and to the NPG 1957. 1 The date assumed from the inscriptions on the original canvas. 2 As quoted by R. Mander & J. Mitchenson, The Artist and the Theatre, the story of the paintings collected and presented to the National Theatre by W. Somerset Maugham, 1955, p 65. Zoffany had already painted Mary Bradshaw on stage with Garrick in 1762.